Every historian has lingering amongst their files and papers intriguing half-followed-up leads. These curious notes or stray references which get jotted down may never be fully explored because they diverge too far from our main research projects or there just isn’t enough time. Occasionally though the sense of intrigue is too much and the researcher is tempted from the path – often it’s a wild goose chase which amounts to nothing, but sometimes it’s these irresistible tangents which make ‘doing history’ so interesting. And, I have to admit, I’m forever wandering off on tangents. When buried deep in ‘research-mode’ the historian needs to keep a clear head and an open eye. Half the fun of research is following up on obscure footnotes. We lose ourselves in the library or archive pursuing our particular path, but often we hit dead ends. Developing a nose for pursuing hunches can sometimes unearth unexpected connections. Thinking laterally is essential. But sheer fluke or chance can sometimes play its part too. I had just such a chance encounter this week. I was idly perusing an old book when a familiar ship unexpectedly strayed into view – literally – because this was a ship I’d sailed upon, so to speak, in another completely unrelated book. But, like all good sea tales, if I’m to tell this one properly, I’ll need to start at the beginning. Last summer I wrote a paper for the Journal of The Royal Asiatic Society China in Shanghai – entitled: Books of Change: A Western Family’s Writings on China, 1855-1949. The paper looks at three generations of the Williamson-King families, each of which had a number of writers who published works on their life and times in China in the late 19th and early 20thcenturies. The first writer from this line which my article examines is the Rev. Alexander Williamson (1829-1890). 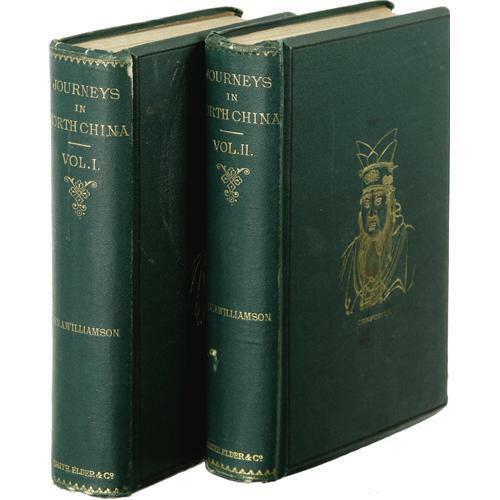 Williamson was a prominent Scottish missionary working in China, perhaps best known for his two volume Journeys in North China, Manchuria, and Eastern Mongolia, with some account of Corea (Smith, Elder & Co.: 1870) – an amazingly detailed account of his travels as one of the first foreigners to be permitted to travel in China after the first Opium War. The two volumes note in (sometimes stupefying) detail points of scientific and economic interest concerning the mineral and botanical resources of the provinces he travelled through, as well as descriptions of the people he met and the towns he stayed in whilst preaching and distributing Christian literature (in Chinese translation) along the way – it’s a monumental travelogue/geographical gazetteer of late Qing China. It must have been a hard and tiring journey on such a small ship. And the unpleasantness only seemed to increase – the Captain’s ability to command his vessel became more and more erratic as the ship progressed further and further from home. The Captain’s fondness for the bottle appeared to grow in equal measure with the lengthening distance. But happily, after a few bumps and scrapes, the Williamsons reached Shanghai in one piece and put to shore for a new life in China. Having written and submitted my paper I thought no more of the Hamilla Mitchell until to my amazement she seemed to hove into view once again, like a long lost ghost of the past emerging from the mist, this time on the pages of another venerable old tome. The book in question – which has nothing to do with my China researches – (bought on a mere whim for a couple of quid from a second-hand bookshop I happened to stray into during a lunchtime stroll earlier this week) is titled The Wonders of Salvage (The Bodley Head: 1924) by David Masters. Masters, who was previously unknown to me, appears to have been a fairly prolific writer of books concerned with deep sea diving – the lead boots and copper helmet with air hose kind of diving (you can read more about him and his books here and here). The Wonders of Salvage tells various stories of deep sea diving quests for sunken treasure, salvaging bullion from wrecks thought lost by their underwriters, or valiant tales of raising ships torpedoed during the Great War. To my astonishment I found that several pages of the book are devoted to the Hamilla Mitchell. Thrilling as were these treasure-hunts, the most romantic story of all is that of the ‘Hamilla Mitchell.’ Here we have treasure and pirates and a desperate chase all mixed up in the most approved adventure-story style. Only, unlike a work of fiction, this story happens to be true. The ‘Hamilla Mitchell’ came to grief on the Leuconna Rock, near Shanghai, and carried down with her £50,000 of specie. She was a total loss, and the underwriters, after paying the insurance, considered the question of trying to salve the treasure. They instructed an expert to visit the scene and report on the case. 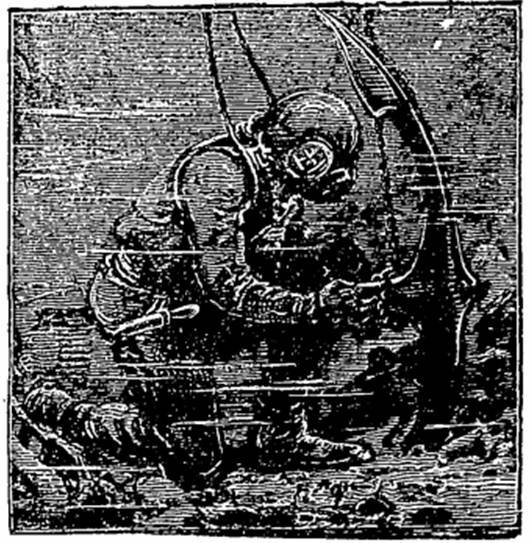 The expert in due course considered that the case was hopeless, that the specie was lost for all time, and that the wreck had gone down in such deep water in so exposed a position that it was much too dangerous for divers to work there – not a very cheerful report for the underwriters to receive. There, for a time, the matter rested. 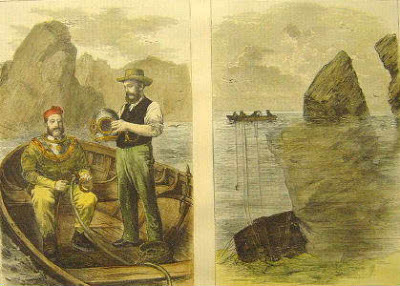 Then upon the scene came a Captain Lodge with an offer to do his best to recover the treasure. The underwriters, unwilling to allow the specie of which they were the owners to remain at the bottom of the sea, agreed gladly to the proposal that was placed before them. Captain Lodge considered the problem most profoundly. He knew that what was lost would not be won back easily, that the odds were, indeed, very much against a single ounce of the precious metal ever again seeing the light of day. This did not dismay him. 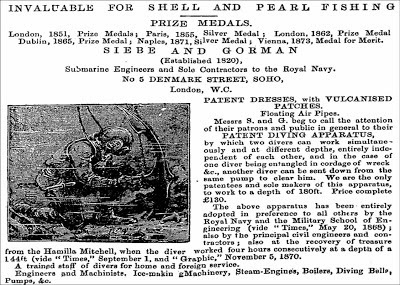 Securing the services of two clever divers, named Ridyard and Penk, he made the trip to Shanghai, taking out with him some special diving apparatus – the finest and most powerful equipment to be found in the world. He wandered about Shanghai looking for a vessel that would suit his purpose, and, coming across a small sailing craft, chartered her and proceeded on his quest for the wreck. Small as was the salvage vessel, she was yet too large to take in-shore among the high rocks, and so the divers had to prosecute their search from the small boat which they towed behind. They searched here, they searched there, dropping over the side of the boat in their cumbersome dress, facing all the unknown perils of the unknown depths. Now they were carefully exploring a ledge perhaps only 20 feet deep, and a little later they would be slipping down the face of a chasm that plunged sheer into the sea for another 100 feet or more. They did not spare themselves in that search, for at times they penetrated to a depth of 160 feet. They were investigating a ledge one day when a dark mass loomed up at one end. They approached it, to find the wreck at last, noting with satisfaction that it was in a comparatively shallow depth which made the prospect of salvage fairly easy. Their jubilation was cut short, however, as they drew nigh. It was the stern that held the treasure, and the stern was missing! Fate had once more been up to her tricks. The ‘Hamilla Mitchell’ had settled with her stern over-hanging deep water. Not for long did she remain intact, for the gales soon broke off the unsupported after end, which slipped off the ledge into the abyss, where the divers managed to locate it in 156 feet of water. The never-ending lines of bubbles from their outlet valves flowed upward to the surface as they slowly explored the stern and prepared for their assault on the treasure-room. It was a most dangerous as well as a most difficult task to work in that treacherous chasm. The currents were strong, the rocks were sharp, and the possibilities of air lines being cut or fatally fouled were not pleasant to dwell upon. Nevertheless, they stuck to their task and eventually Ridyard managed to break a way into the strong room. The sight which met his eyes as he gazed through the windows of his copper helmet was like a scene from some fairy tale. The light, filtering through to that great depth, enveloped the hold in a sort of twilight gloom, all over the place he dimly saw heaps of dollars scattered about. He stooped down to the treasure chests, to find woodboring worms had eaten many of them quite away and the contents of the boxes were spilled in all directions. He walked about on a floor of solid gold; golden coins slipped about under his leaden soles. Anything more romantic would not be easy to find, yet the romance did not appeal to Ridyard. He was working against time, knowing that he would not be able to stand the pressure for long. Every movement was slow and difficult. The water was striving to crush him; he was being saved from this terrible fate solely by the continual flow of air coming down the rubber pipe to his helmet. Four times Ridyard underwent that ordeal of getting into the treasure-room and working under the enormous pressure until he was quite exhausted. On the last occasion he surpassed his previous feats of endurance and struggled doggedly on, loading up the treasure and watching it disappear towards the surface until he had sent up the contents of sixty-four boxes. Strong and fit as he was, he became thoroughly worn out with the toil, so he signalled to those above and made his way slowly to the surface. They dragged him to the deck of the salvage craft and unscrewed his helmet. His face was lined, his eyes were very tired, and his body clamoured for moisture, although he had been immersed in it for a long time. Not a glance did he give to the treasure lying about, the fortune at his feet did not interest him. Penk nipped up a bucket and made his way to a spring at the top of the island under which they were working. Putting down his bucket to fill, he scanned the horizon, as sailormen will. A sudden amazement came over him. The sea was dotted with sails, all making in the direction of the island. Wasting no time, he picked up his precious pail of water and ran down to the ship. “What’s up?” asked Captain Lodge, as Ridyard took his much-wanted drink. “The sea’s full of junks, hundreds of them,” Penk replied. Taking his glasses, Captain Lodge quickly identified the oncoming ships as the junks of Chinese pirates who were making their way towards the island from the farther side to avoid being seen. There was no doubt in his mind what they were after. There was but one thing in that quarter worth having, and that was the treasure stored in the salvage craft. It was obvious that the pirates had been watching operations carefully. 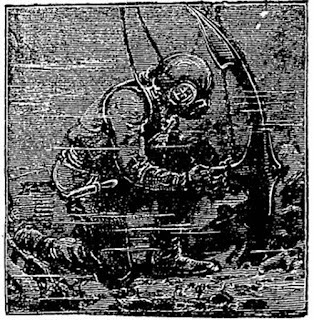 They had undoubtedly planned to allow the divers to recover the treasure, then they purposed stealing down upon the expedition unawares, wiping it out and looting the gold. The pirates were in overwhelming numbers, and Captain Lodge realized instantly that the only thing to do was to run for it. Slipping the anchor to save the time required to haul it up, the salvors hoisted sail. Gradually they gathered way and stole from under the cover of the island. Directly the salvage craft appeared in the open, the junks altered course and started to pursue her. Pity the poor salvors! The wind had practically failed them, yet they could see some of the junks bending to a lucky breeze and overhauling them. In desperation they put out the big sweeps and toiled like galley-slaves to force their craft through the water. Ridyard, tired as he was, took his turn at the oars to try to save the treasure he had salved at such risk. So the salvage boat crept along, with the pirates slowly gaining. More exciting grew the chase. With anxious eyes the salvors watched the distance between their own craft and the Chinese junks growing gradually less. Harder than ever they strained at the oars, dipping them into the sea, throwing all their weight upon them, pulling until the muscles of their arms ached and their backs were nearly breaking. It looked as though the salvors would lose their lives as well as their treasure when the sails, which had been flapping idly, began to swell. A puff of wind stirred their flag, and a steady breeze began to blow. It was none too soon. The salvage craft started to gather way again and forge through the water. Still the junks hung on. They were not going to relinquish their prize without an effort. The pirates continued to chase the salvage craft right until sundown, when a friendly darkness hid pursued from pursuers and enabled Captain Lodge to shake off and lose the bloodthirsty Chinese pirates. In the end he managed to make Shanghai in safety with the rich treasure of £40,000 aboard, thus bringing to a happy ending one of the most exciting treasure-hunts ever known. If Ridyard had not worked quite so hard and grown quite so thirsty, and if Penk had not gone to fetch that pail of water, the salvors would have remained in ignorance of the approaching pirates and would have met a tragic death at their hands. … Perhaps this also means there’s £10,000 of bullion (or whatever today’s equivalent value would be) still out there somewhere beneath the waves? The co-incidence of my stumbling across the deep-water demise and amazing after-story of the Hamilla Mitchell following on from my previous research seemed remarkable. I couldn’t help wondering if the Williamsons had perhaps seen reports of the ship’s loss and the subsequent adventure of its salvaging in the Shanghai newspapers. My interest was piqued and so I decided to see if I could find anything more on the story. Masters was writing some fifty-five years after the event and I wondered what other, more contemporary, sources there might be. It turns out that there are quite a few. Two of the most detailed (and readily available) being The Brisbane Courier (November 12th1870) and The Capricornian (June 11th 1898), from which I learnt that the Hamilla Mitchell was lost in August 1869, and the subsequent salvage operation was undertaken in March 1870 by Messrs R. Ridyard and W. Penk of Liverpool, using state-of-the-art diving equipment procured from a specialist company called Siebe & Gorman, Submarine Engineers and Sole Contractors to the Royal Navy, based at Denmark Street, London, and established in 1820. (An account which mirrors quite closely the re-telling given in Masters’ book was published in The San Francisco Call, December 26th 1910). So, it appears there were two ships(of different type and size) named Hamilla Mitchell serving the same shipping routes at around the same time. A further hunt through contemporary newspapers indicates that as well as the London-China route, the two ships also served as emigrant ships to Australia and New Zealand. But if the younger, larger iron-hulled Hamilla Mitchell was the one lost near Shanghai, whose salvage story sounds like something straight out of the pages of a Boy’s Own adventure magazine – what was the fate of the older, smaller wooden ship named Hamilla Mitchell which had brought the Williamsons to Shanghai some fifteen years earlier? Well, as always, there are hints and echoes out there. A general sounding of the internet has also turned up the suggestion of a third Hamilla Mitchell – one pre-dating our particular vessel – of 145 tons that sank off the coast of South Africa in 1844, as well as a few tantalising hints as to the possible end of our Hamilla Mitchell. Her demise was possibly just as dramatic – and indeed more gruesome and unhappy – than that of the ship of the same name wrecked on the Leuconna Rock. Two separate leads seem to suggest that our ship may have been lost around 1859 (see here and here). * A recent, fleeting mention in The Korean Times (November 14th 2012) speculates that a ship of the name Hamilla Mitchell was lost somewhere off the coast of the Korean peninsula sometime before 1869, where its luckless surviving crew were then brutally murdered. Yet hearsay isn’t the kind of source material to satisfy a historian. There are probably historical records out there which might definitively answer the question (which now niggles to be answered*). A proper ranging quest through the lists of the Lloyd’s Register may well reveal the fate of the Hamilla Mitchell of the Williamson’s journey of 1855. And so, like a loose thread waiting to be tied off, until I get the time to salve the appropriate archives in greater depth – my research file remains far from closed. Sometimes, these tangents to our main research aims can become full fledged projects in themselves – and that’s often the real joy of historical research. The past is a vast and fascinating book full of obscure and forgotten footnotes just waiting to be plumbed! *Postscript: (March 18th, 2017) Combing the Lloyd's Register I've since found several references to the Hamilla Mitchell built in 1850 at Peterhead (540 tons): one, to the voyage taken by the Williamsons in 1855, see here; and another reference which shows the ship was still sailing in 1867-1868, see here. Lloyd's Register also shows the Hamilla Mitchell built in 1864 was lost in 1869 en route to India, see here.